Considering going to the movies this holiday season? You already have preconceptions about many of the films at the theater — and even opinions on the actors and director. And that’s OK. It’s one way we make daily choices, based on past information and experience. But how many of us pretend to have a “conclusion” about God, based on rumors and reviews? My hunch is that there’s a dullness — based on conscious and subconscious wrong thinking — that keeps people away from the Bible. Here are six of the biggest misconceptions about the Bible, which form a lasting (and false) impression about God. What’s the reason for all this death? And the bigger question: Why was God involved in helping the Israelites to wipe out their enemies? Maybe there’s more to the story. Genesis 3:15 is one of the most foundational verses in the Bible. In fact, it sets up the story of the entire Bible. Not only is there a promised Seed — [but] this verse is also a declaration of war. Within hours of the fall of the first man and woman, the gracious redemption plan was unveiled: The Seed would bring justice — through the family of Adam and Eve. But it wouldn’t be quick. And it wouldn’t be easy. God takes his time (about 4,000 years) and gives humankind the freedom to fight. God is faithful to protect His promise, and protect The Seed, even if it means confronting those who tried to destroy it. When you understand the Seed, and the promise of His redemption, the battles of the Bible start to make sense. What if God is not a bully but is a protector? Sure, the compilation of books can seem clunky at times — history books followed by poetry books and then an assortment of prophecy books. And our modern Bible is not exactly chronological — that can create challenges, too. Why, all of the sudden, does the killing end (most of it, anyway) as we enter the New Testament? Why the shift in strategy — from [the] destruction of enemies to “turning the other cheek”? One clear explanation is that The Seed had arrived — finally! — Jesus had fulfilled the role foretold in Genesis Chapter 3. The reason the Old and New Testaments don’t seem to align is [that] God’s strategy changed. The Old Testament strategy (Genesis 3:15) was to bring about this promised Seed, at all costs. The New Testament strategy was not to protect the Seed. Rather it was time for the Seed to die! Christ died, was resurrected to life, and then returned to heaven. The Seed accomplished His mission. There’s no need to fight — not yet. The Genesis 3:15 strategy progressed to a John 3:16 strategy — sharing a message of hope and life. There’s actually some truth here. The book of Revelation is a bit deep and dreadful and can evoke emotions of fear and confusion. Revelation speaks to a future season when things will be heating up again. There will be a return to warfare before the final death-blow to the serpent (the promise of Genesis 3:15 will finally be complete). Revelation also attributes to the seemingly-random nature of the Bible. Why, after the Old Testament, does the earth enter a season of peace and grace, only to be whipsawed right back into judgment? Consider Revelation as one of three “acts” of the Bible. There are the Old and New Testaments — and a Future Testament (Revelation). The New Testament is not a radical shift from the Old Testament, but rather a middle scene, before the final battle which leads to the restoration of all things. With time and study, Bible readers can learn more about these prophecies. But seeing the Bible’s big picture can help. We all know the Bible is eleven-billion words and is impossible to read in a lifetime, right? Actually, the Bible is only 783-thousand words — about the length of 10 novels. You can read it in 60 days, in an hour per day. “Bible scholars” sometimes give the impression that it takes eight years of university and 10 years in a cave to comprehend the Bible. Who has time for that? And if you’ve ever tried a hopscotch 365-day reading plan, Scripture seems even more disjointed. Deep dive studies are important but can make us think we must completely understand every facet of every verse in order to enjoy God’s Word. You don’t have to know everything to learn many things. So, what’s holding you back? Don’t Watch the Movie — Read the Book. When you’ve heard a movie has “senseless violence” or is directed by a “creep,” it’s usually good to steer away from media that doesn’t lift you up. But misconceptions about the Bible can keep you from reading the Bible — which can keep you from seeing the big picture and knowing a powerful, loving God. So don’t rely on rumors, ratings or trailers to judge the Bible. Don’t rely on my review. Read the Book. 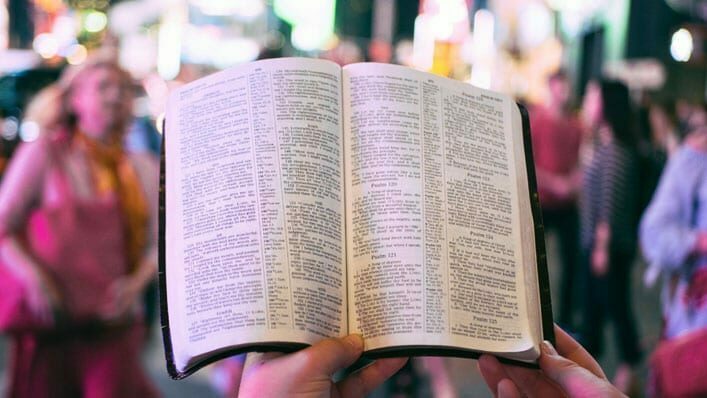 You can read the entire Bible in 60 days, in just an hour per day. My free reading plans and commentary will help you see the beautiful, and stirring, storyline of creation.